Dabbing or smoking concentrates has become a popular thing in recent years. Marijuana concentrates allow you to get a fast and powerful high by using heat to extract the terpene and cannabinoid-rich resins from a marijuana flower. The methods for extracting concentrate from flowers can often be pretty volatile. Butane gas has been used as a way of extracting concentrates until recently when newer options have changed the whole game. This is good news for the many people out there who love dabbing and enjoy the intensity of the high attained from using concentrates. You’ll often hear this method referred to as the rosin tech. Butane systems of extraction have inherent dangers that the rosin tech avoids. The rosin tech (short for the rosin technique) is the name of a new process for extracting concentrates from weed as opposed to the old BHO extract methods. If done correctly, the rosin tech produces extracts almost identical in aroma and taste as those produced using BHO but offers a much safer and healthier option. As the country has become more health conscious, dispensaries have also begun stocking rosin as an alternative to BHO. The rosin tech gives you a solvent free option as a concentrate. It’s an extremely easy process to execute yourself at home and you’ll probably find that you already have everything necessary lying around the house. Place the marijuana in the parchment paper. Wearing the oven mitt, press down hard on the straightener, closing it over the bud. Continue to press the straightener closed over the marijuana until you hear a sizzle or see smoke. This should take about three seconds. You can do this two or three more times, to make sure you’ve extracted all the concentrate. Once this is done you can remove the paper and open it up. You will see the rosin concentrate on the paper. Take the knife and scoop up and store the newly acquired rosin concentrate. The rosin tech is fast and safe and gives you solventless concentrate! The rosin tech produces terpene rich concentrates free from solvents. Another little trick for making the rosin tech work for you is putting the marijuana in an empty tea bag before putting it between the parchment paper. Doing this allows you to collect the rosin with ease since it passes through the teabag filter while all the residual plant material stays trapped inside the teabag. Empty teabags can be bought in all sizes so you can customize for the size you need, keeping in mind the size of your straightener or whatever rosin tech device you are using. 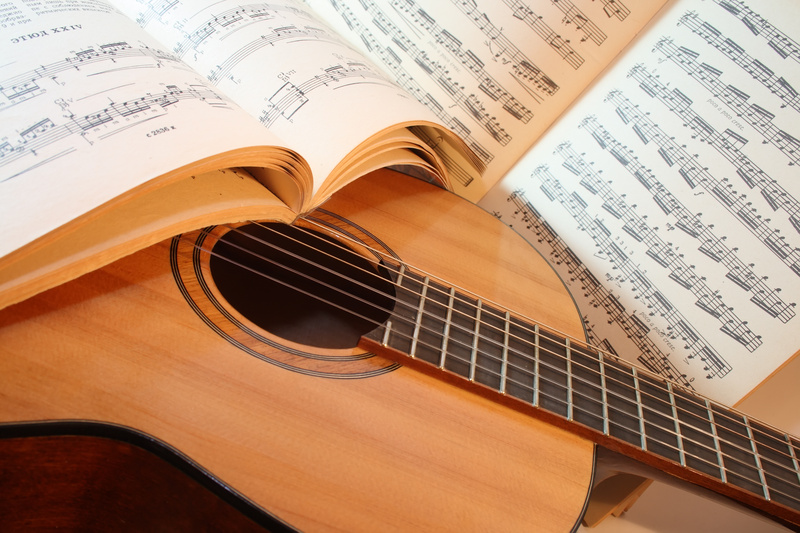 Using heat resistant gloves may also be an easier option for you than an oven mitt, for the sake of comfort and more control when handling the rosin. If you don’t want to use your hair straightener for the job and you’re willing to shell out for an actual official rosin tech press, a whole host of them have become available on the market. At this stage, they could be considered a lot pricier than just using a hair straightener but as the popularity of the rosin tech grows, the price could go down in time. You can find rosin presses in a variety of sizes and styles. The smallest rosin press looks a little like a flat waffle iron. They’re ideal for beginners who want a straightforward, foolproof way of creating high quality concentrates in the comfort of their own homes. It consists of two hot plates with a hinge. That’s about it! All you need to do is just put your pot in there and press. This is a simple device that helps you extract your concentrate with little to no drama. The convenience will cost about $300. There are medium rosin presses available too for those who are interested in making higher quantities of rosin. These rosin tech machines usually have a 5” x 5” inch hot plate and, as an added bonus, these often have a mechanical press or a lever system that will help to really squeeze all the rosin out of your marijuana. This type of larger, more professional press can be found for approximately $500. For people really looking to get serious about rosin tech, possibly even making a living out of it, the larger press is probably for you. These are a lot larger, allowing you to make much more rosin in the same time as the smaller presses. The hot plates for this larger press are usually 20” x 20” large and, on top of this, they usually have some kind of hydraulic pressure system to help you press the rosin cleanly from your buds with ease, making sure to extract every last possible drop of rosin. This kind of machine costs somewhere around $5000 and is definitely for those out there who are going to need to produce high quantities of rosin, quickly and cleanly. While it is more than possible to avoid these costly machines and just use your hair straightener to produce your rosin and get a great product, rosin presses are specifically designed to give you a great product, using the right temperature and pressure necessary to get the best possible quality rosin. They ensure that terpenes are not sacrificed in the heating process, giving you a better quality rosin. That’s what you’re paying for when you dish out the cash and go that extra mile. That’s not to say you can’t produce your own home variety version of high quality stuff but it’s good to know all the options before making a choice with how to proceed. Beyond all of this, going through all the trouble of home brewing your own concentrates just may be too much trouble and too high a commitment for you. In this circumstance, there’s always the option of going to your local dispensary and picking up the perfect rosin. Either way, the rosin tech has opened up an option of getting a solvent free, healthier, safer concentrate that is almost identical to BHO extracts and gives you the same intense high. With recreational marijuana initiatives on the ballots of 8 more states this November and a recent 9th circuit appeals ruling against the Fed’s ability to prosecute medical marijuana cases against defendants in compliance with state laws, there has never been a safer time to grow weed. Big tobacco companies have had marijuana cigarette brand names trademarked since the 1960’s but regardless of what happens post-legalization, there will always be a market for high quality cannabis; and what better way to ensure quality than to grow your own? In this article, we’ll take a look at the first and most critical stage of growing marijuana— germination of seeds. So you’ve decided to grow your own bud but you’re lucky enough to have options— you can get some seeds or you pick up some clones. Which should you choose? 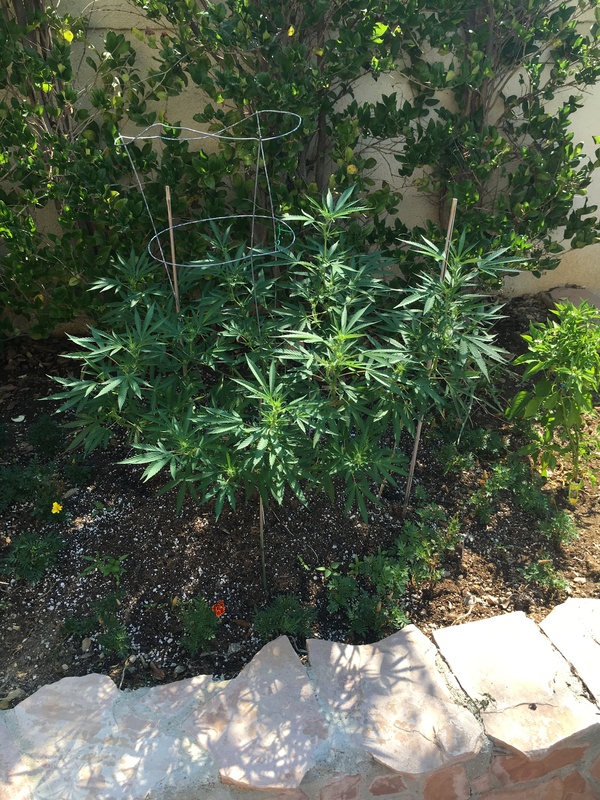 While clones are a convenient way to skip the first few weeks of growth and not worry about sexing (males are usually undesirable), they don’t exhibit the same vigorous growth or fruiting of a plant grown from seed. Additionally, clones have the genetic age of the plant they were cut from and can often be older and more susceptible to disease and undesirable mutations (as well as hermaphroditism). When it comes to germinating seeds there are three techniques that almost everyone uses; the traditional method, the paper towel method, and the cup method. 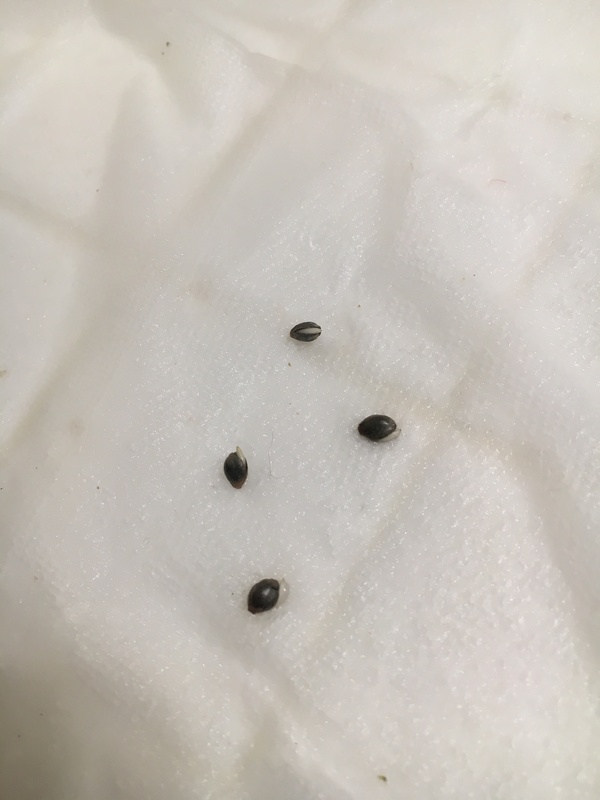 First you need check the viability of your seeds— the most reliable way to test viability of a seed before planting is to squeeze it between your thumb and forefinger. If it cracks, the seed was probably not going to germinate, if it doesn’t crack under the pressure then you likely have a viable seed! 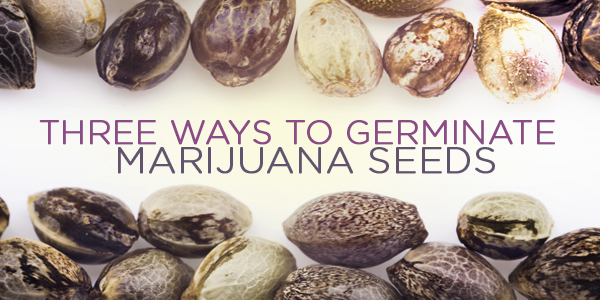 Cannabis seeds come in a truly astounding number of sizes and colors, some with markings and some without, so it’s important to use the “squeeze test” and not rely on looks alone! Once you’ve separated viable seeds from non-viable seeds, you’re ready to germinate. The traditional method is, as you might have expected, just to plant the seed in some moist, high quality organic soil about 1/4” to 1/2” deep. If you keep the soil moist and in a warm place (perhaps on a windowsill), seedlings are likely to pop up after 3-5 days! Some seeds can take a little longer, especially if they’ve been sitting around for a few years (we’ll cover a few tricks for those at the end of this article). 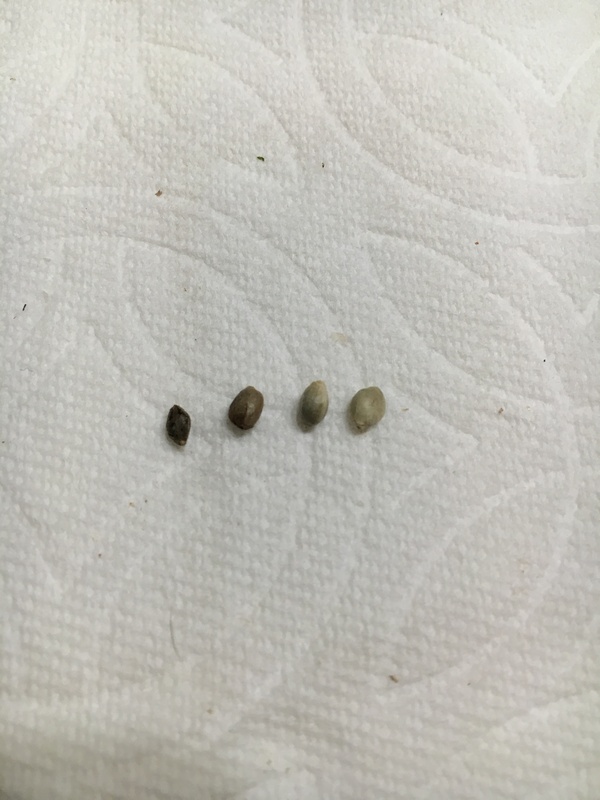 A favorite among pot growers for decades, the paper towel method allows you to see the taproot pop out of the seed before you put it in your growing medium. This is ideal if you intend to use a soilless medium like rock wool cubes where you need the taproot to point downwards. Simply fold your seeds inside a paper towel so it’s wrapped around them like a pouch and then wet the paper towel with some tap water. 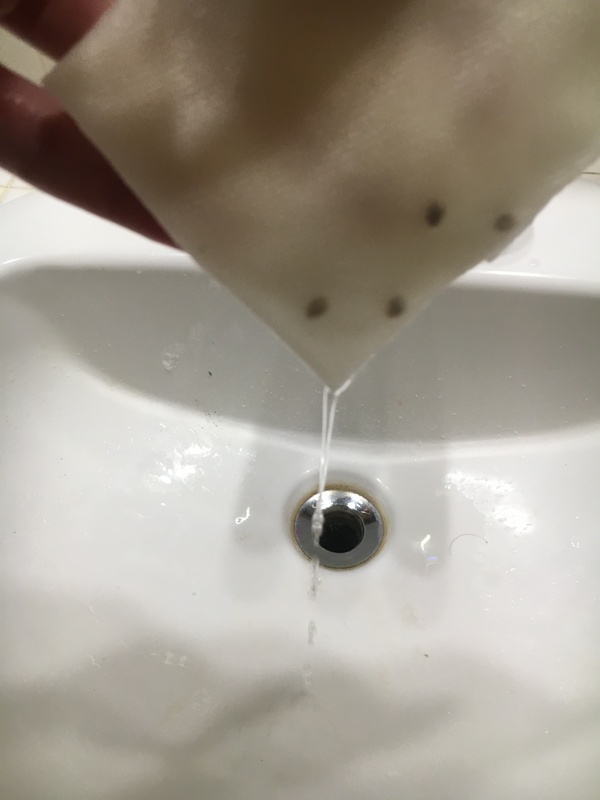 Allow the excess water to drain from the towel (you should be able to see your seeds wrapped inside) and then place the paper towel and seeds inside a ziplock bag to prevent evaporation. Check every 24 hours for a taproot and then remove any seeds that pop as soon as possible to prevent the roots from gripping on to the paper towel (if they do don’t worry, just remove the seed with the little bit of paper towel attached and plant that. Do NOT try to rip the seed off the paper towel as that can damage your fragile taproot!). Remember to be especially carefully of the taproot, avoid touching it with your fingers and make sure it faces down when you plant it so the seed doesn’t spend energy flipping itself over! Perhaps the easiest of all germination methods; simply drop seeds in a cup of water and cover. If left undisturbed, seeds will float on top of the water and sprout a taproot in 24-72 hours. If left longer, roots will grow downward without any negative effects (which is what makes this easier than the paper towel method). The one thing to be careful of is that after 24 hours seeds can sink and drown if disturbed too much. Again, once the taproot appears, plant in the desired medium with the root facing down. tap roots have just sprouted, time to place in the growing medium with the tip facing down! 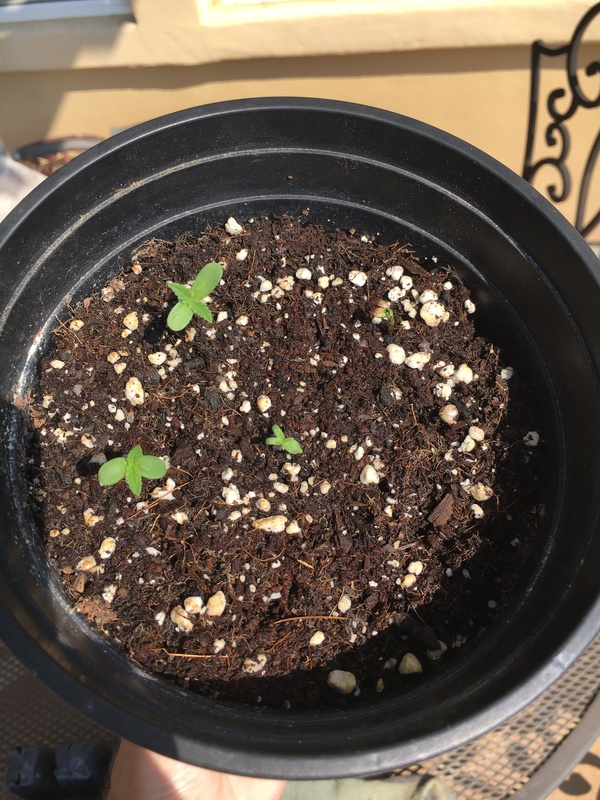 While almost all marijuana strains germinate within two weeks (unlike some of the hottest peppers which can take a month), some older seeds need a little more love to get them to germinate. 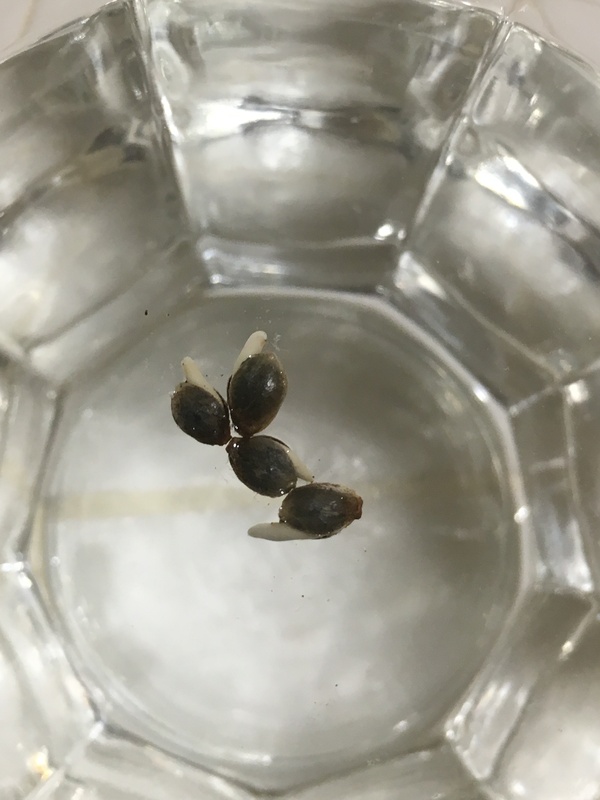 A 24 hour water soak is almost always beneficial to germination of cannabis seeds and sometimes a light sanding of the outer shell— called “scarification”— can help water penetrate the husk to reach the germ in the seed. Some people choose to put their seeds in the freezer for a few days prior to germination to simulate winter and bring seeds out of dormancy. Regardless, if its been three weeks and you aren’t seeing a root or any swelling within the seeds, its time to throw in the towel and start over! Seedlings have sprouted and germination is complete! From a toxicology standpoint, there are few substances less harmful to the human body than marijuana but as Daily Dabbers, we often test the ability of our bodies to process THC leading to ridiculously high tolerances and a decrease in the benefits we enjoy from dabbing. If you’ve got a tolerance that makes single dabs feel like nothing or that’s affecting your day-to-day life, it’s probably time to start addressing it! In this article, we’ll discuss why tolerance happens and how you can plan a successful Tolerance Break to bring that tolerance down with as few negative side effects as possible! On the mental side of things, it’s easy to become conditioned to being high for doing daily activities. Eating food? Take a dab. Get home? Take a dab. Do anything? Take a dab. Once you begin to work dabbing into part of your daily routine, it can start to become more of a habit and lose the enjoyable qualities it provides— relaxation, creativity, peace of mind. It can also begin to affect how you spend your time not dabbing; if you’ve ever skipped out on something you would otherwise like doing except you wouldn’t be able to dab for a few hours, that’s not right! It should also be considered that if you spend most of your time high, is consuming marijuana really allowing you to alter your consciousness or is it enabling you to escape reality? It’s hard to notice an altered state of mind if that’s what you’re used to! On the physical level, THC binds mostly to receptors in the brain called CB1 and CB2 cannabinoid receptors. These receptors exist naturally in everyone’s brain and were thought to exist exclusively for THC until the discovery of Anandamide in 1992 (a naturally occurring substance in humans and animals that mediate many of the functions marijuana seems to affect— no surprise there). 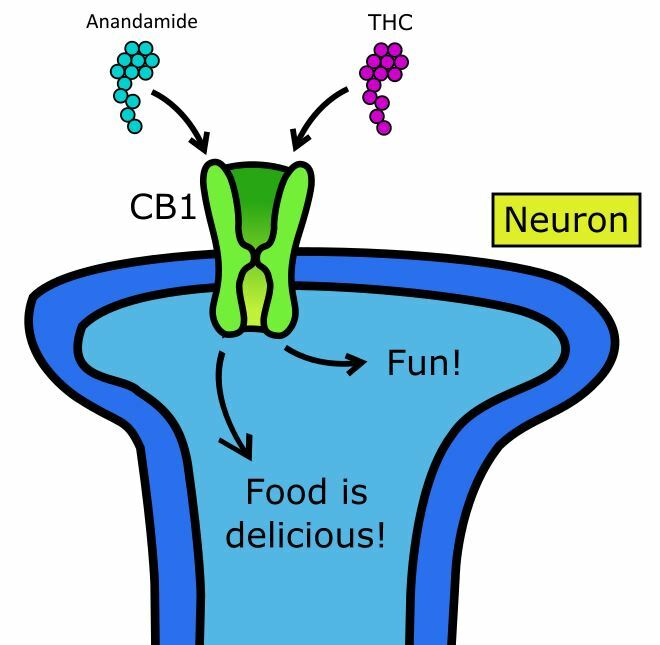 Like many receptors in the brain, these CB receptors are essentially small molecular structures that stick out of the brain and have puzzle-piece like ends that only fit with specific other molecules (in this case cannabinoids and anandamide). Once a receptor is activated, it tends to recede into the brain so it can recover before being activated again. Physical tolerance begins to occur when you have fewer and fewer receptors available to bind with THC. If you continue to flood your brain with THC, it can temporarily wear out the receptors and really make dabbing ineffective. The good news is that it’s only temporary— the bad news is that the only cure is to abstain from consuming THC and allow your receptors to recover. While simply “taking a break” sounds simple, it can prove incredibly difficult; especially if you’re a heavier user. Withdrawal is a very real part of almost any marijuana detox and though the severity depends mostly on how much THC was being consumed, there are steps one can take to reduce these negative symptoms and increase the chances of a successful tolerance break. Planning is key with a tolerance break and setting a timeline is the first step towards a successful detox! Depending on why you’re taking a T-break, you’ll want to set an endpoint somewhere between 2-8 weeks. A week will help reduce weaker tolerances but if you’re a heavy dabber, you’ll want to take more time especially if you plan on passing a drug test (it usually takes about a month for metabolites to leave your system). It generally takes most people 2-3 weeks before all withdrawal symptoms are completely gone which is why we recommend a 2-week minimum break. You’ll also want to plan for feeling under the weather for the first couple days after taking a break— it might be a good idea to schedule important dates before or a few weeks after you start your break if you have such a luxury. You can severely reduce the most disruptive side effects of withdrawal by tapering down your use before stopping completely. Heavy dabbers would be wise to continue smoking moderate amounts of bud after abstaining from dabbing and then taper down on bud before taking a full T-break— the withdrawals from heavy concentrate use can be very unpleasant when stopping cold turkey. Out of sight, out of mind— after you’ve binged your stash away, it’s time to clean the rig and put it somewhere inconvenient to reduce temptation (it’s usually easier to do this immediately after you’ve finished your stash while you still feel good about your decision, lol). If you have a trustworthy friend who you can leave your rig with, there’s no better way to hide your rig than to get it out of your possession. Your brain generally doesn’t like changes to the usual routine and you might find yourself facing unusual boredom, driving your thoughts back towards marijuana use— the key is to keep yourself busy so you don’t have time for these thoughts! This is your opportunity to be productive. Plan some activities for yourself that you’ve always wanted to do, meet new people who don’t necessarily smoke weed. Getting out and involved with people in the world outside cannabis can be incredibly rewarding and you may find yourself so consumed that you’re barely at home facing temptation. The first week, in particular, is usually most difficult when it comes to insomnia, lack of appetite and nausea but despite feeling bad, it’s important to stay focused on good health for the most rapid recovery. You need to treat your T-break recovery the same way athletes treat their recovery— professionally. Eat light, high-quality, nutrient-dense rich meals like chicken and rice with steamed vegetables; if you can only stomach a few bites at a time eat smaller, more frequent meals throughout the day and try to keep your calories up so your body can do its work to readjust. Drink lots of water and avoid sugary foods that can make you feel bad. Boiling fresh peeled ginger root makes an excellent tea that fights nausea and settles the stomach. It’s also incredibly important to exercise. Exercise will help release natural endorphins and release stored THC in fat which will naturally help you taper the cannabinoids in your system while simultaneously detoxing. The calorie burn both helps drive appetite and releases chemicals that help with sleep at night. You don’t need to stick to running but generally, aerobic exercise will be more effective than something like weightlifting (though both are good!). Don’t forget to treat yourself either! Nobody is saying it’s easy but if you can rid yourself of temptation and stick to these guidelines, you’re guaranteed to drop that tolerance and have as pain-free a detox as humanly possible. Remember that taking a T-break isn’t a break from happiness, just weed! Be sure to take care of your mental health and treat yourself to some rewards. With all the money you save not buying bud/concentrates, you might get yourself to a massage, start that hobby you’ve always been interested in, buy yourself something nice that will keep you busy… You deserve it! After a few weeks, you won’t even be thinking about weed. At that point, you’re done! You’ll have a whole new perspective with which to appreciate weed and you’ll get higher than you can remember off your first hit. Get ready for flashbacks of your first time smoking— you’ll probably even wait to lay off the concentrates until you’ve built up some tolerance. And if you find yourself too tempted before you reach your planned end-date don’t fret too much; you can do better next time! It gets easier with practice. What Determines The Price of a Rig? Check the inventory of any head shop and it’ll be hard not to notice the wide range of prices on functionally similar glass pieces. It goes without saying that bigger, heavier pieces consisting of more glass should cost more but why would a disk-perc dab rig from one manufacturer cost $100 more than someone else’s? How can you tell “good quality” glass from “bad quality” glass? In this article, we’ll cover why not all glass is created equal and help you figure out if you’re paying a fair price for a piece. With rare exception, glass pipes are made out of pyrex aka borosilicate glass (also called just boro). This glass is much harder and more heat-resistant than typical soft glass (lime glass) and requires a much hotter working temperature. The key to borosilicate’s resilience is the presence of boron which gives the material a low coefficient of expansion— a measure of how much the glass expands when heated. This reduced expansion provides for much higher thermal resistance which makes it perfect for tough, heat resistant glass vessels; everything from vacuum manifolds to dab rigs (which is why dab rigs don’t explode into a million tiny pieces when you hit them with a torch! A propane torch is barely hot enough to dull a sharp point of borosilicate glass but can easily melt soft glass). A good seal to cobalt glass (top) and a bad seal to grey glass (bottom). Note how the color transitions to the clear. In addition to boron, colored borosilicate contains extra elements which affect the glass’ coefficient of expansion. Cobalt in dark blue glass requires extra heat to melt with while colors like white and yellow require more delicate heat to avoid boiling color out of the glass (turning grey). Some colors contain small amounts of silver which crystalize and form iridescent colors— all these colors require extra more expensive materials and extra effort by the glass blower which drive prices of the final product up. The more time a glass artist has to spend on a piece, the more justified he/she is in charging extra! The downstem on this rig is placed too high up on the can; that’s a design flaw. Flaws: 1. Bubbles, 2. Scar from working the glass, 3. hairline crack. Inspect carefully! Chinese glass with low quality control; these are hastily made assembly line rigs which often have sloppy welds and uneven features. Still, unlike smaller Chinese dry pipes (which should be absolutely avoided), many of these rigs are totally functional and can make a good bargain purchase for under $100. More renowned manufacturers like Roor are guaranteed to function well but you often end up paying extra for the brand name with no practical benefits (especially these days with so many incredible glass artists working in the US). So next time you’re out shopping for a simple clear rig, don’t get tricked into paying more than $100! You can find some very fine options for around $50 or less. If you’re on the market for more of an art p, remember to look out for defects and make sure everything has been melted in properly! It never hurts to contact artists directly, many will make commission pieces at surprisingly good prices (especially lesser known artists). Good luck and happy hunting! There’s no denying that the most potent and flavorful concentrates are made via butane extraction— butane is a nearly perfect solvent given its affinity for cannabinoids, ease of removal and non-toxicity. Unfortunately, as the media and opponents of legal cannabis are quick to point out, the flammability of butane poses a serious safety hazard; especially with so many untrained clandestine chemists making dangerous attempts in their garages, bathrooms and kitchens (such environments are dangerous even with proper equipment and experienced personnel). With many medical states like Colorado and Washington cracking down on BHO producers, forward looking extractors have become more interested in supercritical CO2 as a much safer, cheaper, less explosive alternative to butane. CO2 is cheap, non-toxic, odorless/tasteless, and readily available with excellent purity for use across a broad range of industries. Because of its relative safety and widespread use, it’s particularly easy for just about anyone to purchase large volumes of pure, compressed liquid CO2 without any anyone else batting an eye (just ask anyone who home-brews beer or soda). The catch? 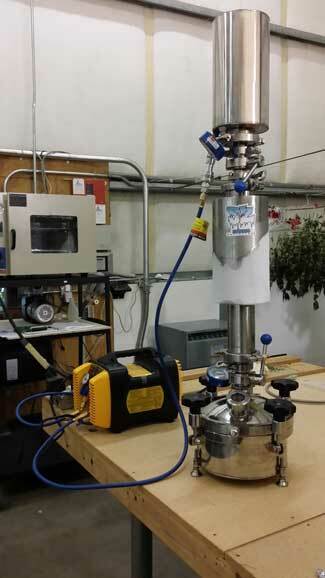 One cannot simply blow CO2 over marijuana leaves and extract the THC; the CO2 must be in a supercritical state. 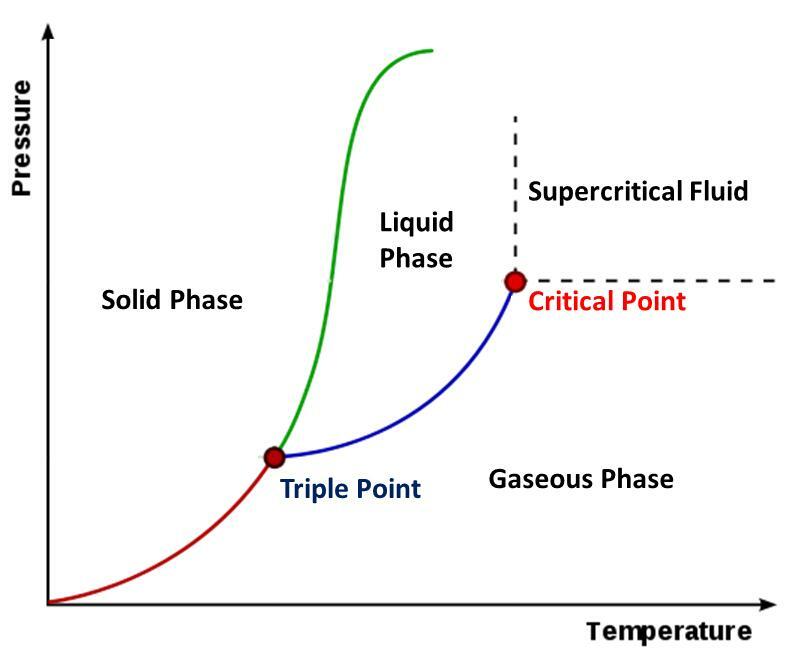 We all know about the solid, liquid and gas states of matter— “supercritical” is a special state that exhibits the traits of both a liquid and a gas. At pressures above 1100 PSI and temperatures higher than 88ºF, CO2 enters the supercritical state and its solubility (ability to extract different compounds) becomes a function of temperature and pressure. This is what makes supercritical CO2 extraction so desirable in the commercial natural extraction industry: its selectability can be fine tuned in real time to pick up lighter molecules (terpenes) or heavier molecules (cannabinoids) while minimizing the pickup of heavier plant fats and waxes. 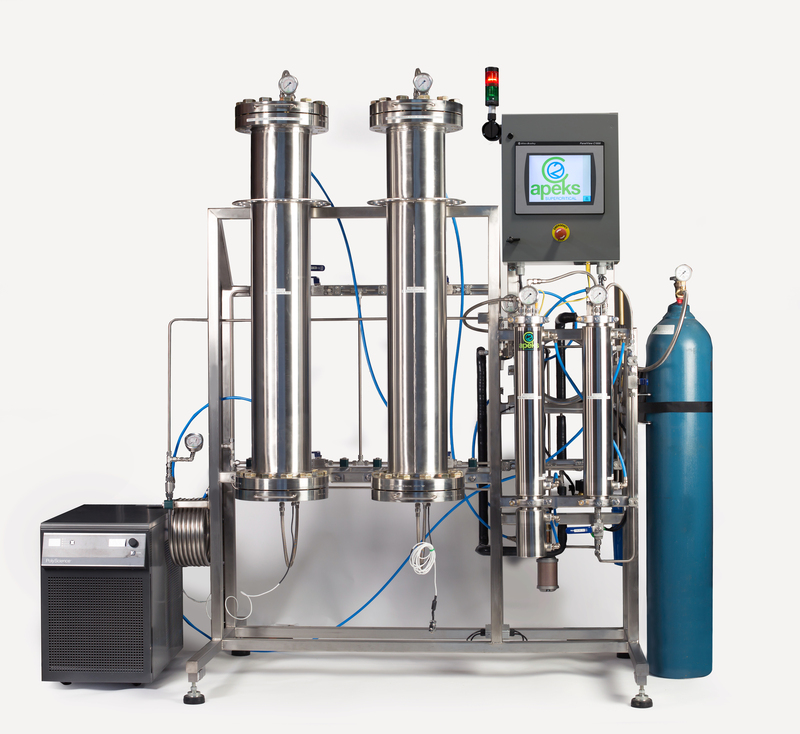 CO2 extracts certainly aren’t anything new but the costs to obtain the technology and expertise required to run a proper extraction are hundreds if not thousands of times greater than the costs involved in making BHO (an automated system can cost anywhere between $50K-$100K). While temperature and pressure have relatively little effect on the solubility of butane in a closed-loop BHO extraction, a few degrees can mean drastic changes in the final product of the CO2 extraction (often resulting in that dark, bitter CO2 oil most people are familiar with). In many cases, uneducated extract makers subject their raw CO2 concentrate to additional seperation methods like ethanol “winterization” or thin film distillation completely destroying any terpenes that may have been present (or not, many CO2 extractors use trim with low terpene content in an effort to generate higher margins and pay off their heavy initial investment). This is why they add artificial flavors to products like “the clear”— there’s very little good, natural taste left after all the processing and its entirely possible there’s not even an effort to separate different strains before extraction. That being said, it won’t be long before you are impressed with CO2 extracts. The technology has evolved quite a bit even in the last two years with now multiple companies offering comprehensive extraction systems and some of the more scientific, state-licensed extraction labs in Colorado and Washington creating some truly impressive raw products with purity and terpene profiles that rival live resin. As marijuana legalization continues to sweep across the US, the safe production of concentrates will become a bigger and bigger issue with states looking to one another about how to handle it. There is absolutely no doubt that state governments will favor CO2 extraction over butane— it wouldn’t be surprising to see BHO gradually phased out as governments put a regulatory squeeze on butane extraction and CO2 technology becomes better and more affordable. So next time you come across some good looking CO2 concentrate, keep an open mind! You might be surprised. The days of hot knife hits are long gone but the need for a butane-powered soldering torch has always been an off-putting aspect of owning a dab rig. Aside from looking like straight up hard drugs, torches make it easy to set your surroundings on fire and the combustion of torch fuel (butane or propane) releases carbon monoxide which can become dangerous in poorly-ventilated areas. The latest and greatest dabbing technology comes in the form of the “e-nail” short for “electric nail.” The e-nail utilizes an electrical circuit to get the nail hot via induction heating rather than the direct heat of a torch. Operation is simple: a heating coil sits on a specialized titanium nail and its temperature is set via a variable controller. Though heating might take a little longer than with a torch (it usually takes about a minute to reach a steady temperature), its not so bad as to cancel out the convenience of not using the torch. In fact, most e-nails use so little power that they could be left on (in a safe place) for substantial periods of time without any real damage to your piece or power bill. When using a torch, not heating up the nail enough can lead to a “cold hit” during which some portion of concentrate doesn’t vaporize and simply collects in the bottom of the nail, waiting to be burned off during the next heating. This is no longer a problem with the e-nail; in fact, the flexibility of temperature control allows e-nail users to benefit from the use of a “carb-cap” to slowly and carefully vaporize concentrate at low temperatures, allowing for a greater terpene profile to be expressed (albeit increasing ‘holdup’ or accumulation of reclaim within a given piece). Even at normal operating temperatures, the nail never needs to get as hot as it does with a torch, reducing the amount of concentrate that gets carbonized (burned onto the nail) and reducing the overall stress applied to your rig. Now of course, the e-nail has it’s own concerns; its easy to forget it’s hot which can lead to burn fingers if you’re not careful… and it can certainly burn a hole in the floor if dropped without noticing! But these things shouldn’t be too big of an issue for concentrate smokers used to dealing with the hassle of a torch– if you’re a daily dabber, you’re really doing yourself a disservice not owning an e-nail! The simplicity of the design means there are many manufacturers (not just name-brands) who make great, effective products. So if you’re in the market for some new dabbing gear, this should be at the top of your list! Just be warned– once you start using an e-nail you won’t want to use anything else! Absolute Shatter: Make Your Own! Alright dabbers, let’s face it: most of us just can’t puff on live resin all the time. For those of you who live in states where medical marijuana is outlawed, it can be particularly difficult to find clean concentrates of reasonably high quality. Even in California, it’s not uncommon for people to settle for darker, harsher, less expensive concentrates processed under less-than-optimal conditions when options are slim or money is tight. Luckily, there are several processing methods one can use to clean these concentrates— one method, commonly referred to now as “winterization,” is particularly safe and can be used to further purify even high-quality concentrates. Butane-extracted hash oil tends to be a mix of cannabinoids, terpenes, lipids and other plant waxes that get pulled out by the solvent during extraction. In order to separate the active cannabinoids and terpenes from inactive plant waxes via winterization, the concentrate must be redissolved in a new solvent (ethanol aka grain alcohol) that is liquid at room temperature so its solvability can be more easily manipulated by temperature. Once the concentrate is dissolved, the mixture can be cooled such that the inactive waxes and lipids precipitate out of the solution (form solids) which can then be filtered, leaving you with a pure cannabinoid/terpenoid mixture. The resulting resin is known as absolute shatter because it contains no inactive impurities. First about the alcohol: if you live in a state where you can obtain 190 proof grain alcohol then all you have to do is buy a bottle and you’re ready to go! Those of us who can only obtain 151 proof are wise to purchase a few lbs of molecular sieves from a legitimate lab supply store online in order to dry out 151 proof alcohol. Molecular sieves are zeolite pebbles with pores just big enough to trap water molecules. Slowly pour the alcohol into a mason jar (preferably cooling in ice, the reaction gets HOT!) and let it sit overnight to allow particles to settle at the bottom and the water to be trapped by the sieves… you can leave the alcohol in that container until you’ve used it all (at which point you should burn off the remaining alcohol outside and then bake the sieves in the oven at max heat for a few hours to dry them out…. Once your alcohol is ready, it’s time to get to it. 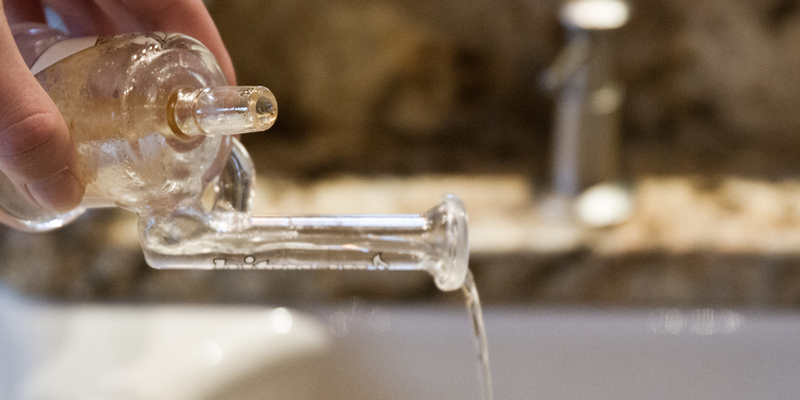 Combine the alcohol and concentrate in a glass container and heat it up with your hotplate or water bath such that all solid particles have dissolved, it takes a few minutes. I’ve found about 30ml of alcohol per gram concentrate is sufficient, it’s preferable to use as little alcohol as possible since you’ll be evaporating it off later. After your concentrate has fully dissolved in the hot alcohol, cover the container and carefully place it in the freezer overnight along with the funnel and another container— we need these to be cold. When you come back in the morning, you will see some solids floating in solution. Those are the inactive waxes! Time to filter these out. Fold the coffee filter in half then in half again so it’s a quarter circle. Stick this in the frozen funnel and let it sit in the freezer for a few minutes to make sure it’s cold. Now you’ll want to position the funnel-with-filter so its resting over your empty frozen container and slowly pour your alcohol-concentrate mixture through the filter. You’ll want to use a mason jar or some other container that makes it easy to rest the funnel and let the solution filter with the freezer door closed. If the solution warms up, the waxes will dissolve back into solution… the colder the better! Method 1: (no vac) if you pour the liquor off into a thin layer, the alcohol will evaporate off with just a little air circulation (you can put it somewhere warm to speed things up). Method 2: you can use a vacuum chamber to “cold boil” off the alcohol but if your pump uses vacuum oil, a cold trap is advised to capture alcohol fumes which quickly ruin clean pump oil. Check the consistency, it should form a fairly stable shatter once fully purged (and even if not fully purged, you’re just vaporizing small amounts of ethanol which reacts with water) and even darker absolute shatter tends to be exceptionally smooth and enjoyable since no long plant molecules are being burned. As always, use an abundance of caution (with regards to safety and publicity)! Alcohol is still flammable! But don’t be afraid to try this process on a small scale if you have a hard time finding good quality concentrate. Stay safe, stay educated, happy dabbing! Rosin: The Death of BHO? Up until very recently the term “Rosin” has almost exclusively referred to the bi-product obtained from pine tree sap— after the sap is distilled to cook off and collect more volatile components (mainly terpenes, this is how the solvent Turpentine is created! ), you’re left with a tacky resinous cake used in everything from violin bows to pharmaceuticals. These days, however, the term “rosin” has been popping up more and more with regards to Cannabis. Though the idea cannabis rosin has been around since the early 2000s, it really exploded in popularity at the end of 2014 when it started gaining traction in the forums as a solventless alternative to BHO. 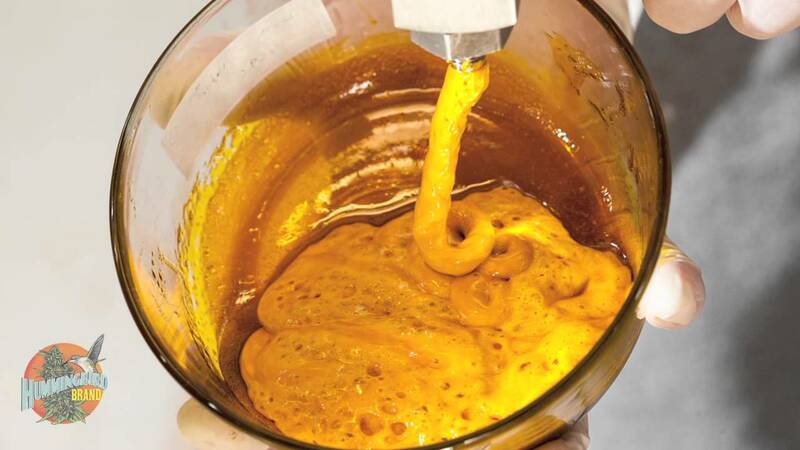 In March of 2015, YouTuber and cannabis enthusiast John Berfelo posted videos entitled The Death of BHO which really set the internet ablaze— he showed how anyone could make beautiful golden dabs with a little bud, some parchment paper, and a hair straightener. Since then, rosin has become the hottest topic in the cannabis world complete with a new set of products dubbed “rosin tech”… but is rosin really the death of BHO? It’s true, the process of making rosin is much safer and more legal than running a butane extraction, but it also has its own drawbacks. To create rosin, trichomes (either on the bud or separated via dry sift) are heated and pressed in parchment paper with a hair straightener so that volatile oils inside the trichome heads can break free of the cuticle and re-condense along the edges of the paper. The process of heating the volatile oils causes the lighter terpenes to be lost almost completely, so while THC content remains relatively the same (in fact, the heat helps decarboxylate THC-A into THC), rosin dabs have significantly less flavor than BHO, particularly compared to live resin where terpenes are specifically preserved. Rosin also becomes difficult for anyone trying to scale up beyond what a single hobbyist can do with a hair straightener. Since industrial rosin processing involves large-scale distillation which creates many grades (fractions) of product and is technically beyond the ability of most people making cannabis rosin, many in the cannabis industry have turned to things like small-mesh filtered “tea bags” and t-shirt presses to create rosin at scale but it seems like a work in progress. With purging technology as good as it is and the popularity of sub-zero, closed loop butane extraction, I think it’s safe to say that BHO is going to remain king of concentrates for quite some time. Use PARCHMENT paper, not wax paper— parchment paper uses a thin film of silicone that won’t melt. Start with the lowest temperature and slowly work your way up until you find the right setting on your hair straightener. Even those with digital temperature readings aren’t made to be exact and each one will behave slightly differently. Set the temp too high and you’ll vaporize the rosin away! There’s a fine line between perfect heat and too much. Don’t let the bud move around while you press! It can wipe up the resin collected along the edges. Press, move the bud to a new spot, repeat. Good luck and happy dabbing! We’ll be here when you guys get curious about absolute shatter. The quest to create the finest marijuana extract is and endless one, but in the last few years we’ve achieved a new pinnacle of excellence in the form of what we call “live resin.” Live resin has steadily been gaining traction amongst dispensaries and extract enthusiasts (as well as quite a bit of attention from the various cannabis competitions this year), but what sets live resin apart from other high-grade extracts? Put simply, live resin contains far more terpenes than your usual “cured nug-run” concentrate— as much as 5 times more by weight. If you’ll recall from our previous article on terpenes, these compounds are responsible for the incredible flavors and aromas found in marijuana and exhibit beneficial medicinal properties; live resin offers a massive terpene profile previously unavailable through traditional extraction methods and patients are taking notice of the vibrant flavors and terpene-mediated effects. The key to achieving such a high terpene profile is a special processing and handling of raw plant material before and during the extraction process. Since terpenes are volatile compounds (meaning they evaporate at room temperature), the total terpene concentration in a given marijuana plant steadily decreases once the plant has been cut; research shows that a plant can lose as much as 60% of its total terpene content during the drying and curing process. live resin, entire fresh plants (not just the nice buds) are frozen immediately after being cut which both partially dries the plant and dramatically slows the loss of terpenes over time. Since frozen trichomes are very brittle, plant material must be handled carefully to prevent trichome heads from being lost. 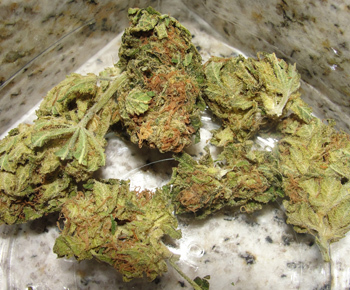 The fresh-frozen plant material has a much higher water content than traditionally dried buds and must therefore be extracted at very cold temperatures (sometimes sub-zero temperatures with the help of what’s called a “dewaxing column”) to reduce the number of impurities and lipids that make their way into the collection chamber (remember chemistry fans, butane is slightly water soluble at room conditions… by bringing the temperature down water solubility becomes essentially 0 and waxes precipitate out of solution). The result is a much lighter yield than you might expect from extracting an equivalent amount of dried buds but the end product tends to be both lighter in color, less stable (more gooey) and absolutely more flavorful. To be clear, live resin isn’t any more potent than regular nug-run shatter. In fact, most live resins should theoretically be slightly less THC-rich than regular shatter— but with the high THC concentrations both products offer, it would take the most discerning of tolerances to be able to tell the difference. 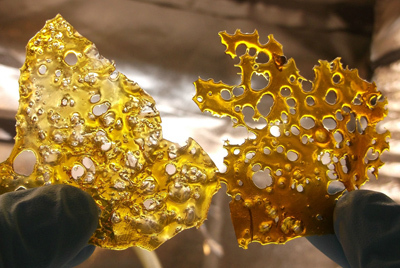 No, the notable difference between regular shatter and live resin is the incredible, floral, aromatic flavor. Next time you’re in a dispensary shopping for concentrate and wondering whether its worth a little extra to pick up some live resin, remember it takes extra effort to produce a lower yield than traditional shatter… maybe give it a try and see what the future of cannabis is all about! We don’t think you’ll be disappointed. With marijuana concentrates more popular than ever before, it’s easy for the average consumer to get lost in trying to navigate the many options available on the market. While price is generally a reliable indicator of quality relative to similar products, its hardly an empirical method for determining how good a concentrate will be before you have a chance to try it. 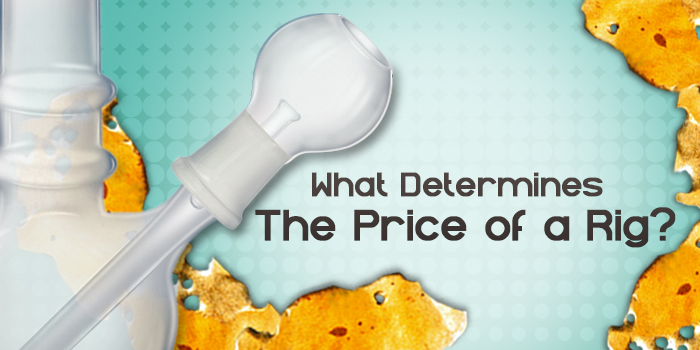 In this article, we’ll discuss what experienced connoisseurs look for in their concentrates so you can be better prepared the next time you head to the dispensary to pick up some dabs. You have five senses at your disposal— sight, smell, taste, touch, and hearing. You should use as many of these tools as you possibly can when shopping for concentrates! Of course, the easiest way to accomplish this is to test a sample but since that’s rarely an option for the average consumer, it often falls on sight and smell to do the bulk of the investigation. No worries! These two very powerful tools… if you know how to use them. A careful visual inspection of a concentrate can determine a lot right off the bat. Better concentrates will have a lighter color to them and will take on a color similar to blondehash. Darkness or a green tinge is usually a sign of impurities pulled from the plant as a result of poor-quality butane / technique (though darker-colored purple strains seem to come out a little darker). Good shatter is filtered and should be mostly translucent— there should be no discernible particles trapped anywhere. Consistency should be as advertised, So, if you’re paying for shatter, you shouldn’t be getting sugar. More liquid, sappy shatter will either be poorly purged or have a high terpene content whereas more solid, stable shatter will always have substantially fewer terpenes leading to a less pleasant flavor. Sugaring can be caused by prolonged improper storage, a rushed purge, or from substantially high volatile terpene content so additional inspection is usually required. Its generally harder to determine how good sugar will be before sampling which is why it tends to be cheaper. If you can, be careful to observe if the concentrate sticks to whatever its on or if it breaks apart easily— drier, more crumbly concentrates are usually over-purged and lack the flavor profile of “wetter” looking concentrates. According to Dr Alan Hirsch of the Taste Treatment and Research Foundation in Chicago, 90% of what is perceived as taste is actually smell. That means that a solid whiff of your concentrate in question should be a good indicator of how said concentrate will taste. That’s two senses in one… you should always smell your concentrates before you buy! A stronger smelling concentrate is bound to have more flavor and be more enjoyable than a mild-smelling concentrate. And while there is really no way to determine if one flavor profile is “better” than another (to each her own), there are some smells that you want to avoid; you should be skeptical if you detect any unpleasant or chemical smells, especially if the concentrate has a more liquid consistency or a strange color. Be wary of liquid-like “solvent-less” concentrates available in different fruity flavors, these are often achieved with flavor additives (same with pre-filled cartridges that use e-juice). If you can’t smell anything, you can expect the concentrate to not taste so great. Finally, we have to address the different qualities of plant matter that go into making concentrates. Obviously nug runs are going to offer the most potent, flavorful concentrates because those buds have higher concentrations of cannabinoids and terpenes. This is what you want if you’re looking to get the full concentrate experience. fewer terpenes than nug runs and more impurities— these always tend to be darker and more “stable” with much less impressive flavor (even though some will pass the “smell test”). Is there good, tasty PNR or TR shatter? Sure! You’re just going to be disappointed many, many times looking for it. If you’re going to spend the money, its almost always worth it to spring for the nug run. It’s a lot to remember… but after enjoying higher-quality concentrates for a while, these considerations become second-nature. Perhaps the best way to get started is to treat yourself to the nicest concentrate you can get your hands on and enjoy it… really enjoy it. Make yourself familiar with what a really good concentrate is like and work your way backward… that way you’ll be ready to pounce next time you see a deal at the dispensary (and avoid the disappointing traps)!